This is where the story of Mowgli — A boy raised by family of wolves is set. If you’ve watched the movie, read the book or seen the animation series and are smitten by jungle tales, then Nausheen Tareen suggests head to Pench National Park, Madhya Pradesh where it all happened. A long weekend beckoned and we started looking for options close by to drive down to. But having done the usual grind often we thought why not check out the National Parks in Madhya Pradesh. 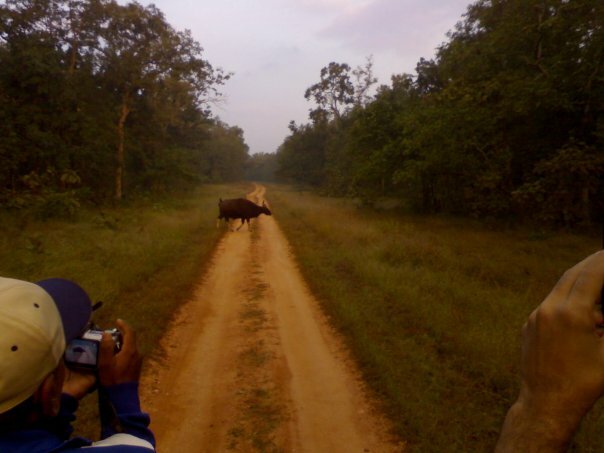 My husband had already been to Pench, the land of Mowgli. His narration of the legend of wolf boy and my fascination with the setting of Rudyard Kipling’s book instantly convinced me to head there. 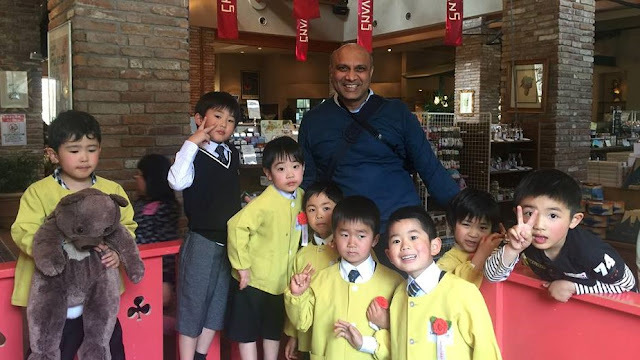 We landed at MP Tourism Delhi office, Janpath, booked our stay and safari and four of us had our bags packed and ready to board Nagpur flight. Pench is probably the best connected National Parks of Madhya Pradesh. It is 88 km from Nagpur and the NH 7 drive from Nagpur to Pench is a breeze. 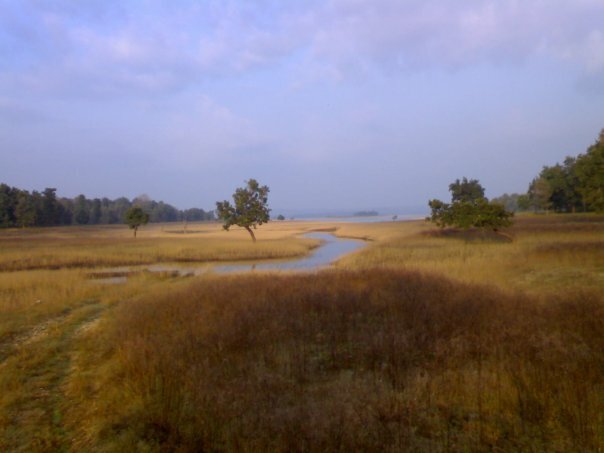 Pench National Park is located in Seoni district in Madhya Pradesh. It is fairly easy to reach as compared to other parks of the state Kanha and Bandhavgarh. We took an early morning flight to Nagpur and covered the 88 km distance from Nagpur by road. I must add that the drive on NH7 was fairly smooth. In about five hours, we had reached Pench from Delhi. As we reach closer to the park, signs of Mowgli welcoming you to his land prep you up for the charming time ahead. It brings back memories of the animation series that was such an integral part of our childhood. Pench is named after River Pench that flows through the park. It was declared a national park in 1983. The journey from Delhi till our destination Kipling’s Court was a breeze. The resort maintained by state tourism also turned out to be a very decent accommodation. We had a light lunch on reaching there and decided to take it easy for the rest of the day. Since the resort is located within the conserved area so there aren’t places to go out and see. Our safari was to be next morning. The day was spent listening to tiger sighting tales from excited groups who had returned from their afternoon safari. Excited at the prospect of sighting Sher Khan ourselves, we decided to sleep early and be at our alert best lest we miss out on our moment with the big cat. Madhya Pradesh state tourism department must be congratulated for their efforts at promoting tourism in their state. We woke up early, had a light breakfast and before sunrise were in the open bus that was to be our Safari transport for the day. We were tourists on a mission. Our aim was to see all the spots that we had dreamt of since childhood. From spots where Mowgli met Bagheera to where he played with Bhalu and of course see Sher Khan, this jungle trail was nothing less than a pilgrimage for us. The first thing that struck us was that it was colder than what we had expected. The topsy turvy unpaved road lead us to the park. Our guide seemed pretty knowledgeable about the park. He seemed to know the place inside out and his knowledge of bird species in the park was second best to none. Right after entering we spotted a herd of bison leisurely crossing the passage. That was followed by sighting deers, monkeys, langurs (Sher Khan’s informers! ), jaguar, a large variety of birds, bear, jackals and of course wolves! The trail took us around the forest and we kept hearing about the possibility of sighting the tiger but Sher Khan decided not to show up. We enjoyed the fresh air and roller coaster ride across the jungle though couldn’t spot the tiger. Even though we didn’t see the tiger, the jungle trail and vast open expanses were too good a memory for all of us. Reliving the Jungle Boy tales is an experience you all should undertake. We returned from the Safari, enjoyed lunch in resorts’ cafeteria and dozed off. 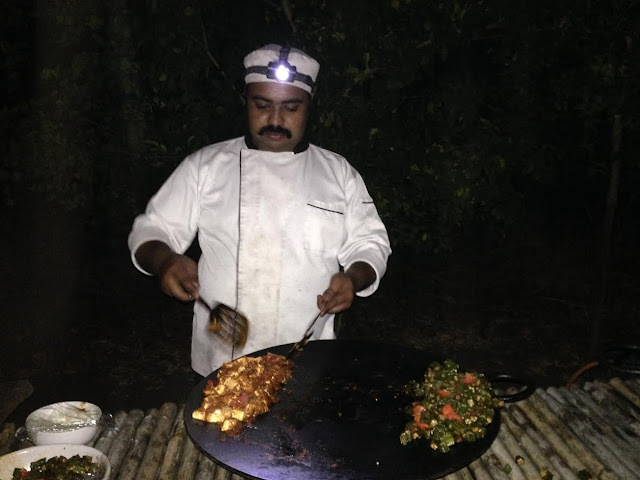 We decided to visit the Taj Baghvan resort for dinner and having to navigate your way with torches and finally meeting a chef with light on his helmet were some more unique experiences we had. The Bundelkhand specialities cooked in a jungle setting added to the charm of our dinner. Pench is a pretty doable weekend visit. Next time a long weekend beckons, pack your bags and head there. Believe me you wouldn’t be disappointed. How: We took a flight from New Delhi to Nagpur (1 hour 35 minutes) and then reached Pench (88 km, approx. 2 hours) by road. Kipling’s Court Resort run by Madhya Pradesh Tourism is a decent stay option. For luxury stay options there is Taj Baghvan. Best is to book your stay and safari from local MP tourism office in your city as we had booked ours from New Delhi.